This building "Laputa Asagaya" accommodates in its basement "Samsa Asagaya" where two performances of Gesshoku-Kageki-Dan were made. "Samsa" is the name of the protagonist in "Verwandlung" by Franz Kafka. 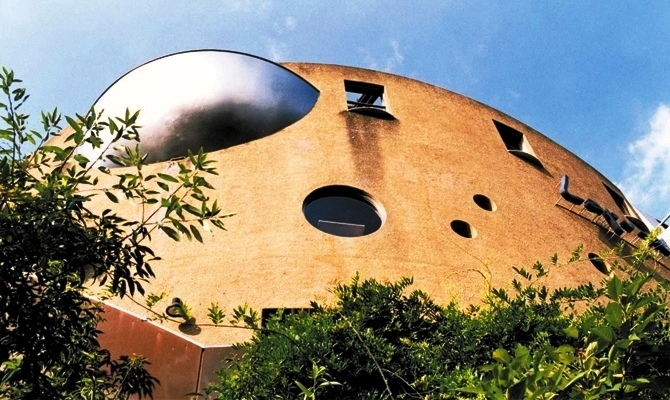 The building's name "Laputa" came from an animation film by Hayao Miyazaki and its restaurant name "Wild Cat" from a short story by Kenji Miyazawa. Recently I visited two performances of Gesshoku-Kageki-Dan (L'opera de l'eclipse lunaire). Gesshoku-Kageki-Dan is a theatre company led by Ei Takatori, who was a partner of Shuji Terayama (1935-1983) and directed Terayama's dramas in his latest years. Shuji Terayama founded a theatre company Tenjo-Sajiki and made diverse experiments. The performances of Tenjo-Sajiki created sensations both within and out of the country around 1970. With the death of Shuji Terayama, "Tenjo Sajiki" also ceased to continue its activities. Ei Takatori founded his own company two years later. However, he did not intend to succeed the theatrical tradition Terayama had laid down, I believe. It was J.A. Cesar, the music composer of Tenjo-Sajiki, who is said to be the authentic successor of Terayama's theatre. Cesar organized Ban'yu-Inryoku (Experimental Laboratory of Theatre @ Universal Gravitation) together with 30 actors and staffs of Tenjo-Sajiki in 1984 and tries in particular in recent years to reproduce the authentic style of Shuji Terayama . As I explained in another article, the theatre genre to which Gesshoku-Kageki-Dan belongs is called "Angura" (underground). Such companies as Kara-gumi, Shinjuku-Ryozanpaku, Ban'yu-Inryoku, Ryuzanji Company, Sajiki-Doji are typical "Angura" companies. Angura was the first reaction to the Western theatrical methods from the Japanese creators and had its zenith in the 1960s and 1970s. Angura theatres are made in particular with surrealistic ideas, exaggerated gestures, outbursting emotions and dramatic monologues. It constitutes an antithesis to the main stream of the Western theatres in Japan, which are traditionally influenced by socialist and marxist phylosophy and as far as theatrical practices are concerned by Stanislaw system. Such characteristics were revolutionary and apploaded by the then-young people in the 1970s, but can be seen as unsophisticated by the young people of today, who are accustomed to monotonous life. But, I love dramatic and thrilling plays and want to experience the emotional outbursts and energetic over-actions. 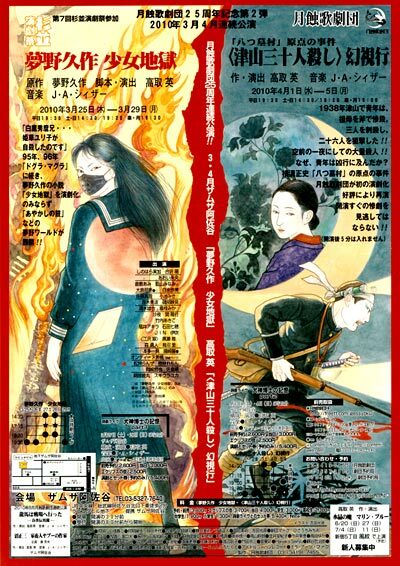 The flyer for "Shojo-Jigoku" and "Hallucination with Tsuyama Massacre". The title of the first play is "Shojo-Jigoku". This can be literally translated as "Girls' Inferno". The Japanese title does not give us a clear idea what it means, but obviously it deals with hells created by girls. The original novel was written by Kyusaku Yumeno (1889-1936), a writer of mysterious and bizarre narratives and detective dramas. The combination of pure and innocent girls and inferno is itself somewhat perverse and I believe that this was exactly what the author intended. The original Shojo-Jigoku consists of three short stories in which a nurse, a bus conductor and a school girl are respectively involved in mysterious crimes. Ei Takatori picked up the stories of nurse and school girl and mixed them with two other novels of Kyusaku Yumeno: Ayakashi-no-Tsuzumi (Mysterious drum) and Inugami-Hakase (Doctor Hound-God). The main story of "Girls' Inferno" is that of a nurse Yuriko, who is an extremely beautiful nurse but also a genius liar. A mysterious drum - the owner of the dram is destined to fatal tragedy - is lost and Doctor Hound-God and his opponents are fighting each other to get it, and they all suspect Yuriko. Another play was written by Ei Takatori himself on the basis of two real criminal cases and its title is "<Tsuyama 30-nin koroshi> Genshi-ko" (Hallucination with Tsuyama Massacre). Tsuyama massacre happened in 1938 in a provincial town Tsuyama and thirty people were killed by a young murderer Mutsuo Toi who commit suicide after the massacre. Mutsuo Toi failed the medical checkup for conscription due to tuberculosis and as a result all girls he had relations left him. In anger and desperation, he tried to commit a bigger affair than Sada Abe, who shortly before that became famous through killing her lover and cutting off his genital, so that he could be remembered by people after his death. The play follows the two affairs and links them with fictional and supernatural creatures. I simply enjoyed the performances. Both plays were typically "angura" in their style and appeared like sensational police news. They both handled the stories in the pre WWII Japan, when people were still poor, human rights were often neglected, military and feudal morals dominated the society and the war was going on in China. This is the typical world for "angura" theatres. It is not alien to me, but I am not sure how deeply and correctly the present young spectators could understand the reality of the dramas. But, spectators appeared to enjoy the mysterious mood on the stage which was strengthened by often melancholic music and dance, old-fashioned languages and colorful kimono and young actresses. In fact one of the characteristics of Gesshoku-Kagekidan is the overwhelming number of actresses. It is often called "Dark Takarazuka" - Takarazuka is a famous and popular girls' revue theatre. However, maybe partly because of the high percentage of young and inexperienced actresses, there was a lack of powerful and convincing expression. "Angura" theatres need actors and actresses with extremely strong character more than usual theatres, because they have to give reality to the incredible and surrealistic drama. We can see the successful cases at Kara-gumi, Sajiki-Doji or Ryuzanji Company. Here, Gesshoku-Kageki-Dan needs some more improvement. A narrow alley filled with tiny bars near Samsa-Asagaya: the area could excape the ravages by airraids during WWII and fits the world of Gesshoku-Kageki-Dan.